Have you ever seen some people praying and they make you feel like you are not a Christian at all? When they speak in tongues it is like the sound of waters BUT they don't have anything to show for all that prayer. Do you know why? God doesn't reward what we do in public, He only rewards what we do in secret! 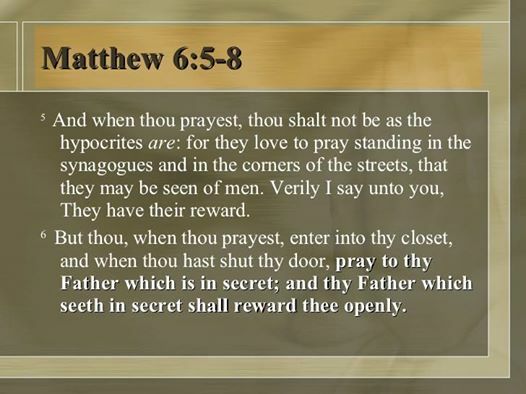 Jesus said in Matthew 6:6 (NKJV) But you, when you pray, enter into your room, and when you have shut your door, pray to your Father who is in secret; and your Father who sees in secret shall reward you openly. God says when you pray in secret He will reward you OPENLY! There is a reward for prayer! There is a reward for serving God! It is however shocking that those who LOOK as if they work the most are the ones who don't have any rewards. Why you may say? Jesus said they do what they do to be seen by men and because of that they have their reward! In Matthew 6:5 Jesus said "And when you pray, do not be like the hypocrites, for they love to pray standing in the synagogues and on the street corners to be SEEN by others. Truly I tell you, they have received their reward in full." Next time you see someone shaking his head and praying violently watch them closely to see if their PRAYERS match their RESULTS. Be wise there are many snakes and wolves in sheep clothing. May God help us to discern in Jesus name. You too can be a social media evangelist, kindly share and repost this Gospel of Jesus Christ so that others can be blessed just like you have been blessed. Thank you for reading.